Once you have arrived at our Musher's Camp, you will meet the dogs, climb onto a custom made, wheeled sled designed specifically for running during the snow-less summer months, then sit back and watch the team pull. 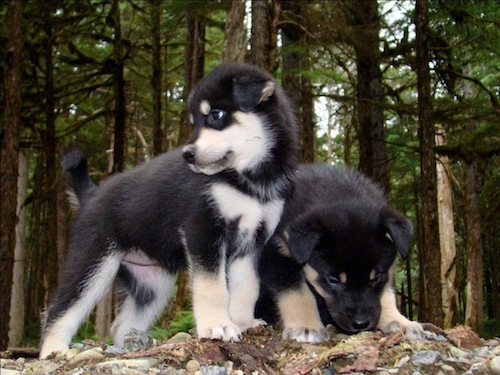 Your team of 16 huskies will whisk you along a one-mile trail surrounded by gigantic spruce and hemlock trees - many of which are hundreds of years old! After the ride, sit down and enjoy a rich and historic presentation of the sport from one of our experienced mushers. Before heading back, don't forget to cuddle with the adorable husky puppies. Enjoy some refreshments and wander through the camp to visit with the dogs and the mushers whose hard work, dedication and love, make mushing such a unique and wonderful sport. Dress according to the weather. However, the weather can change quickly, so we recommend you dress in layers. If needed, you can leave extra layers in the bus while you are on your excursion. Rain ponchos will be provided in the event of wet weather.